It might be hard for some to believe, but spring is almost upon us! For those of you who have horses staying warm in the barn out back, it’s time to think about transitioning your horse into the spring season. It’s important to prepare for the change in the weather, and gradually re-introduce your horse to his springtime pastimes. 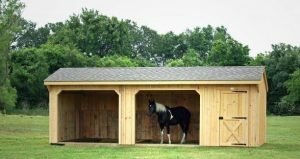 Here are some tips to keep in mind as you get your barn and your horse ready for the spring. While temperatures might be warming up across the country, and the sun staying out later than usual, you shouldn’t rush your horse out to pasture. Grazing all day after a winter diet of hay can be a shock to his system. Instead, slowly re-introduce your horse to grazing. Wait until the grass has grown about six inches high, and allow your horse to graze for about 15 minutes per day. Incrementally increase the time your horse grazes by about another 15 minutes per day, until he’s out in the pasture for hours at a time. 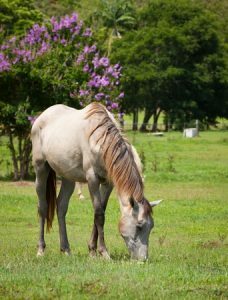 For the first few days of grazing, keep your horse’s diet of hay just like you did throughout the winter, weaning them off as they switch to grazing. This will give his stomach time to adjust to the grass after being used to digesting only hay during the winter. The past few seasons have seen quick swings between very cold days and very hot days—it’s uncomfortable for humans and horses alike! If you notice the temperature creeping hotter than usual for the season as the spring arrives, take steps to keep your horse cool. Don’t assume that just because it was cool the day before means your horse will be able to tolerate high temperatures. Horses are prone to heat strokes, just like humans, and standing out in the sun all day is no joke. Make sure that there’s a constant supply of cool, fresh water, and provide a few shady spots for your horse to relax, away from the sun. Your property’s trees might not have all of their leaves back quite yet, so you can rig a temporary shady area with a couple of old sheets against the barn. Keep your horse’s mane trimmed, and his hair brushed. Once the sun starts streaming, even if the temperatures are cool and comfortable, apply a bit of zinc oxide sunscreen to his ears and noses. 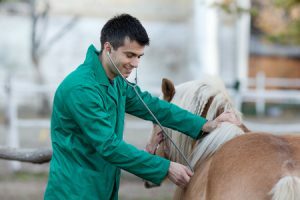 As the weather starts to warm up, and your horse switches from his winter routine to his summer routine, it’s important to check in with the vet. Spring is the start of mosquito season, so it’s important to get your horse vaccinated before he’s spending lots of time outside. And, getting a check-up is always a good idea every season. It’s important that you get a clean bill of health from the professionals before your horse gets started with his busy summertime routine. The winter months can be lazy ones for your horse, especially if he’s confined to the barn for most of the day. After you check with your vet to make sure he’s healthy, get your horse started on an exercise regimen to get him back in tip top shape at the start of the spring season! If it’s been a while since your horse exercised vigorously, take him on short rides with frequent breaks to slowly build up his strength. Jumping back into a long day out on the trail can cause fatigue and even injury to your horse’s muscles or joints. You need to get your barn ready for the spring season, too. After the ground thaws out, do a thorough walk-through of your grounds, replacing any rotted or damaged fencing, shoring up the barn, replacing fly traps, and clearing walkways. Winter can wreak havoc on your property, especially if you live in an area that gets harsh winter weather. Spring is often considered “muddy season” at the barn since everything is thawing out and it’s raining more often, so you’ll need to take steps to protect your hay and your horses from mud overload. Fill mud-prone areas with gravel or sand, and take precautions against flooding, like digging trenches to divert water away from your structures and work areas. Keep the hay indoors where it will be dry, and keep an extra pair of wellies in the barn for your feet! Spring is also a great time to replace any run-in sheds, barns or cabins on your property that didn’t stand the winter too well. Luckily, Deer Creek Structures has pre-fabricated barns and sheds, as well as the option to design a custom structure for your property. Click here to contact us at Deer Creek Structures today to start preparing for the spring!